After a few days of extreme heat, Mayor de Blasio launched a $106 million initiative on Wednesday to protect New Yorkers from the risks of dangerously high temperatures this summer. 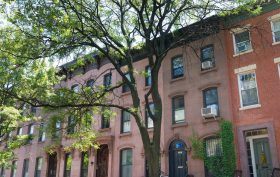 The Cool Neighborhoods program aims to lessen the effects of the “urban heat island effect,” a problem that occurs in New York City due to its abundance of heat-holding asphalt and concrete and lack of greenery. According to Gothamist, to reduce heat-related health risks and deaths, the city plans on planting more trees on streets and in parks, supporting forest restoration efforts and painting roofs of homes in vulnerable areas with reflective white paints. In 2007, officials launched MillionTreesNYC, an initiative with the aim of greening New York City through the planting and care of one million trees. While the city surpassed its goal in 2015, planting 1,017,634 trees by the year’s end, efforts to increase leafy canopy coverage across the five boroughs has not wavered since. With that said, if you’re a New Yorker who feels that your street could use a bit more greenery (ahem, Sean Lennon), getting a tree planted on your block is much easier than you may think. By simply filling out a request with the New York Parks Department, you can get a tree planted, for free, so long as the plot you have in mind is suitable for planting. Just as New York’s population is a melting pot of ethnicities, the city’s tree population is just as diverse. A new interactive chart from Cloudred give us a look at how tree genus breaks down across the five boroughs. As seen above, if one zooms in on the largest chunks of graph across Manhattan, Queens, Brooklyn, Staten Island and the Bronx, it becomes quickly apparent that maple, oak, pear, and planetree trees have their roots firmly planted in the ground—as do a bunch of “unknowns,” which account for about 14 percent of the city’s total tree population. If you feel like your allergies go into overdrive when you’re in the city, don’t be so quick to blame it on all the dust and must being kicked up by passing cars. As it turns out, New York’s flora is far more diverse and abundant than you’d suspect. 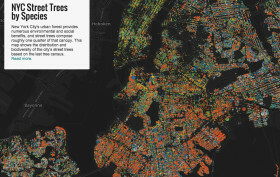 Jill Hubley, a Brooklyn web developer, took data from the 2005-2006 Street Tree Census and found that there are about 592,130 trees on public streets alone. But beyond pinpointing where each street tree sits, Hubley’s map also identifies a tree’s species and trunk thickness. What emerges from her study is a kaleidoscope of colors and a fascinating look at the city’s biodiversity.